Although Elise knows her alphabet (mostly), I want to condition myself to start emphasizing the sounds of the letters correctly. After all, an alphabet is just a code; the use of an alphabet is what makes a language. And truth be told, I can whip out my Southern-drawl-plus-New-York-speed accent in a heartbeat and no one here in Seattle can understand what I’m saying. Yep, it’s definitely me that needs some practice! On a seemingly unrelated topic, I finally organized all my cookie cutters and lo-and-behold, after sorting and storing all of those, I found something for Elise to craft with. Who can beat a recycled shadow box door hanging? If you don’t have copious amounts of cookie cutters, you can use a blueberry or strawberry container! 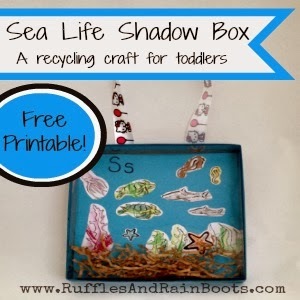 Click on “Read More” to swim with us in our shadow box sea! We were reading one of Elise’s books about sea life and she kept noting the words that began with “s.” Some of her favorites: sea horse, seaweed, and starfish. I’m going to mention the book but it’s out of print now. It’s part of Brimax’s “Look and Learn About” Series: Animals in the Ocean. You can find them on eBay or through used book sellers (really inexpensive) and you should look for them. They are great reference and learning books for kids from 3 to 5. Elise has a couple and LOVES them. Now, I’ve been wanting to buy those little, plastic figurines sold at all the craft and toy stores – you know, the ones in tubes? They are cheap, Chinese crap, but they are great if you want to build a diorama or have a themed sensory box. And, Safari Ltd (the company who makes them) cites that they are Phthalate and lead free and they state to exceed global safety requirements. What’s stopping me you ask? Well, Safari Ltd also states that they are for 3 years and up. And you’re right. And I don’t. But for something made of plastic and is small enough that it could possibly go in her mouth? Yep, I’m going to follow the recommendations. I mean, it wasn’t that long ago that we thought Pthalates were just A-okay. In fact, there are a ton of schools across the country that are still using facilities, toys and learning resources that do contain them because they haven’t all been phased out of use. After chewing on that awhile, I talked myself right on out of getting them. She’ll have enough time in her childhood to play with them, so I’m not considering it too much of a loss. 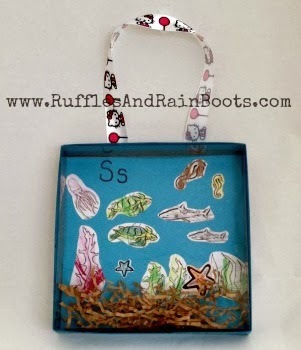 Anyone can make one of these simple shadow boxes and all ages of kids seem to love them. 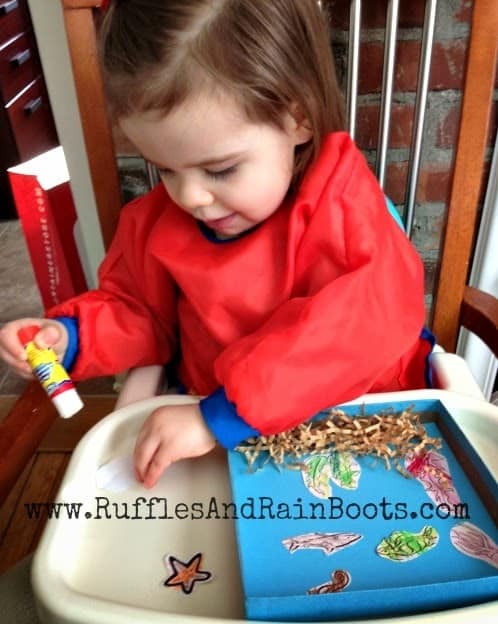 Oh, and you can even add another element that would be super fun and also good for some fine motor skill practice: you could have your child glue sand to the bottom of their sea, just like there is in an ocean. And, I had just blow dried my hair. We just used some basket filler we had on hand and Elise took to calling it her ‘pweetend’ sand in no time. a recycled cookie cutter retail box (with plastic cover) repurposed for a shadow box. Oh and I just thought of this: you could use a pint-sized blueberry container or even a bigger strawberry container (the plastic ones) and make a smaller shadow box. I think I just started planning our next one! 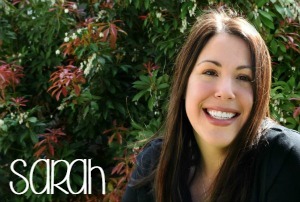 Just click on the printable picture (in the blue frame) and it will open so that you can print. Using this link will NOT require you to sign up for anything new or add any “ghost” programs with an installation program! Thanks, Google for making that little change. I gave Elise the printout and she colored the pieces while we talked about each of them. She then pulled out how much “sand” she wanted from the basket filler supply. She pulled out the shredded paper strand by strand. How’s that for artistic dedication? While she was lost in fine motor skill heaven, I cut out each of the shapes for her. 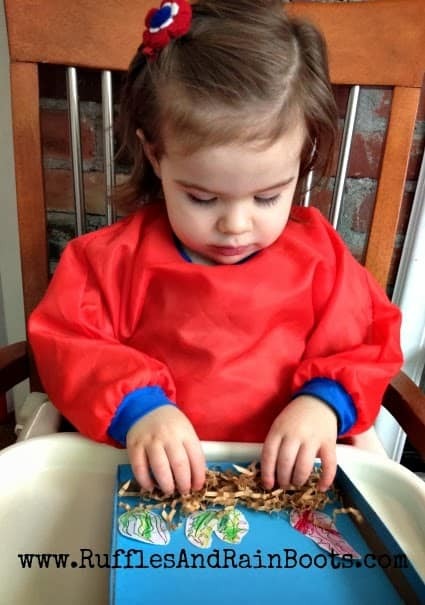 Once she had her desired amount of “sand,” Elise glued on the blue backing and started on each of the pieces. Some of them were more difficult for her to glue – the small seahorse and starfish – so I was asked for help. Oh and I know “sea turtle” is a stretch, but she really likes turtles (kind of like her Gigi). I am a bit sad that I didn’t take a video of her placing each one in the shadow box. It was great to watch her put it down, decide it wasn’t where it should be, and then move it. She is really starting to decide what she does and doesn’t like, and this is great practice for her to learn how to cope when she couldn’t move one because it had been affixed too long. The final piece – the ribbon hanger – was chosen by the little one as well. Could you tell? This idea of mine didn’t start out as a door hanging decoration, but I’m so glad Elise thought of it! I think she misses the snow globe she made (which turned out to be a very popular Pinterest item, so others must have liked it as well). We are grateful you stopped by and really love hearing from you. Let us know you visited in the comments section and we’re always looking for new learning ideas if you want to share them. 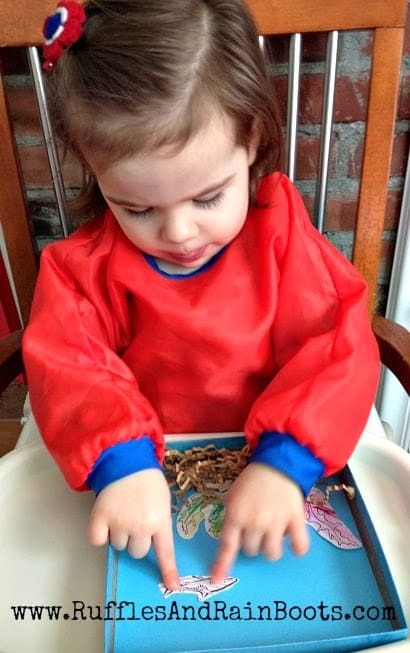 Don’t forget to sign up for our newsletter via email so you don’t miss any of our fun! Remember: we do NOT share your email addresses with anyone – we hate that, too!